If you have activated IPv6 in Raspberry Pi (Raspbian Wheezy), then all IPv6 addresses are formed from the MAC address (hardware address). Unfortunately, it is always the same, which is why the client or host concerned can be identified by this address. For privacy reasons, that's a problem. Of course, Privacy Extensions is only relevant if a router distributes a global prefix within the local network. Otherwise Privacy Extensions will remain inactive even if it is activated in the settings. 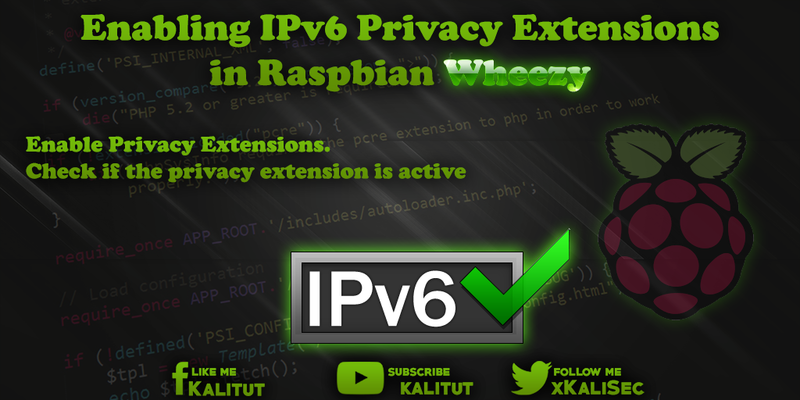 Under Raspbian Jessie, IPv6 is on by default and Privacy Extensions is enabled. The following tasks are for Raspbian Wheezy. Note: There may be several reasons why Privacy Extensions is not active in spite of proper configuration. Privacy Extensions usually does not affect link-local addresses beginning with "fe80". It does not become active even if no global prefix is distributed on the local network or if static IPv6 addresses have been configured for the network interfaces. Check if the privacy extension is active. First, open a configuration file. This entry ensures that Privacy Extensions is activated for "all" network interfaces. If you do not want to enable Privacy Extensions for all, but only for selected interfaces, replace "all" with the name of the interface. For example "eth0" or "wlan0". Optionally, you can specify how long the temporary addresses generated by Privacy Extensions should be used (value in seconds). It is not discarded immediately, but a new temporary address is created and used for outgoing connections. The old one will be finally discarded later, if for a while no more traffic comes in at this address. This value can be additionally limited with a second value. After a restart, the Privacy Extensions should be active. A restart is not necessarily required. Reading in the system settings does it too. However, one should check in any case whether the interfaces have generated a temporary global IPv6 address. Here, the corresponding interface should have a global IPv6 address. If not, no prefix will be distributed in the local network or Raspberry Pi has not gotten any yet. Here you have to wait maybe one or two minutes and then try again. If Raspberry Pi then has a global IPv6 address, then there should be an additional global IPv6 address that has no traces of the MAC address. If this address does not exist then Privacy Extensions has not become active. Then you really have a problem! First of all, check the existing network interfaces. Usually one works with "eth0" or "wlan0". Here you look after the setting of Privacy Extensions. Here the command line should output "2". If not, then the default setting was not accepted. In this case you have to make the setting separately for each interface. So again open the configuration file. And of course, as usual, Reboot is doing well. After the restart you have to check again with "ifconfig". If the settings have been applied, then there is also a global temporary IPv6 address, which is used for outgoing connections and changed regularly. Then save, close and reboot.